IMPACT is a clinical trial testing oral immunotherapy (OIT), a procedure that researchers believe may help stop peanut allergy. OIT is a term for a process by which small amounts of a food allergen (in this case, peanut) is ingested and built up over time to try to establish tolerance. The IMPACT study has two goals: to use peanut OIT to lower the risk of allergic reactions; and to determine whether this therapy can change the immune response, so that even after immune therapy is stopped for a long period of time, symptoms of peanut allergy do not re-occur. 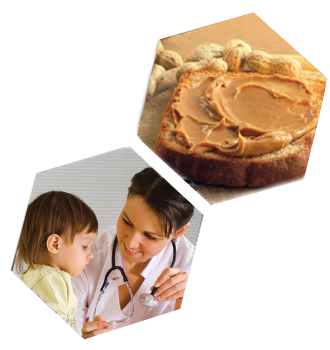 Eligible participants with peanut allergy will be randomly assigned to receive either peanut OIT or placebo for 134 weeks (2.5 years) followed by peanut avoidance for 26 weeks. (6 months). Total study participation will be 160 weeks (3 years), and includes an initial dose escalation, build-up, maintenance and avoidance phases. One hundred forty four participants at five U.S. clinical sites will receive allergy testing, dietary counseling, and physical examinations and will be asked to provide occasional blood samples that will be used to examine differences in immune system development in each of the study groups. All study-related care and treatments are provided at no cost to you.